Minimum wage is such a debated issue because of the paradigm it creates for unskilled laborers. Economists and politicians often argue that the wage levels should differ because unskilled workers are earning more money than they should. We have this predicament because it is difficult to place a value on labor in the first place. On the other hand though, skilled workers who may have been unemployed before taking a minimum wage paying job are now working for pay that correlates to living below the poverty line (a full-time employee earning $7.25/hour will make $15,000 a year, which is below the poverty level for a family of three). Moreover, other analysts and politicians (Republicans) argue that raising the minimum wage will result in less job creation and more unemployment. On a strictly economic and financial basis, I can understand this point of view. Logically speaking, why would business owners offer more jobs to prospective employees if they must allocate more money for wages? Economics is based on the belief that all decisions are made rationally, and rationally speaking, I would not provide job opportunities for people if it were more expensive for my business. What if a spike in minimum wage wasn’t as beneficial as politicians and economic analysts make it out to be? What if, from a callous business perspective, an increase in wages was completely impractical? 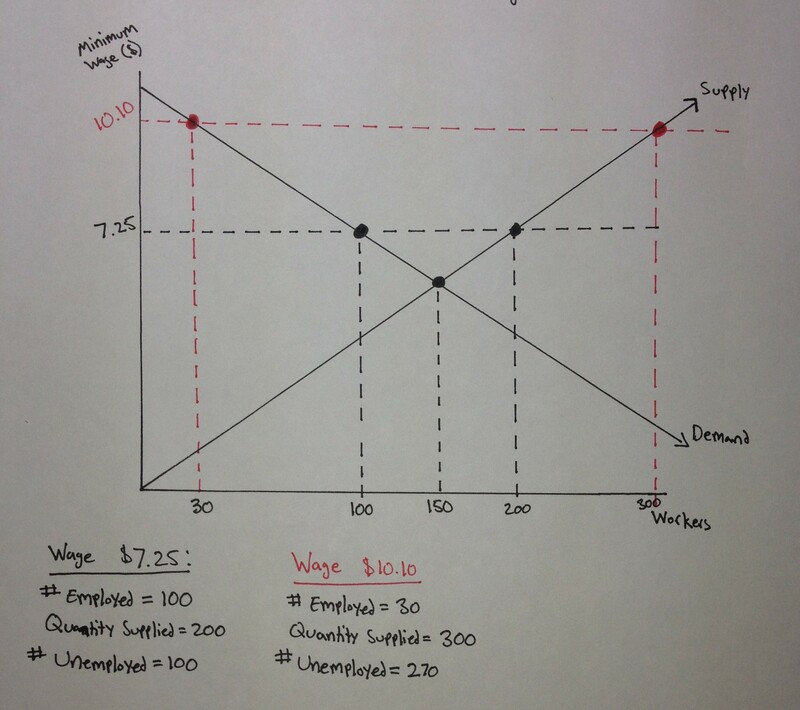 By examining a simple supply-demand graph regarding wage floors and those employed, we can hypothetically observe what would happen if minimum wage rises to $10.10. *Disclaimer: All values, except for the minimum wage prices, were arbitrarily chosen for the sake of simplicity and illustration. In a perfect world, where micro/macroeconomic principles are fully applicable (never going to happen), all decisions are rational and based at the margin where marginal benefit equals marginal cost. In such a theoretical world, there is an equilibrium minimum wage value that would accommodate all perspective employees and all business owners looking to hire. On the graph, this quantity demanded and supplied is 150. The problem with this idea though, is that (A) unemployment will always be present in an economy, as there are frictional and cyclical unemployment levels that arise due to the ebb and flow of an economy, and (B) this ambiguous wage would be so low for the employees that they would not be able to support themselves or their families. 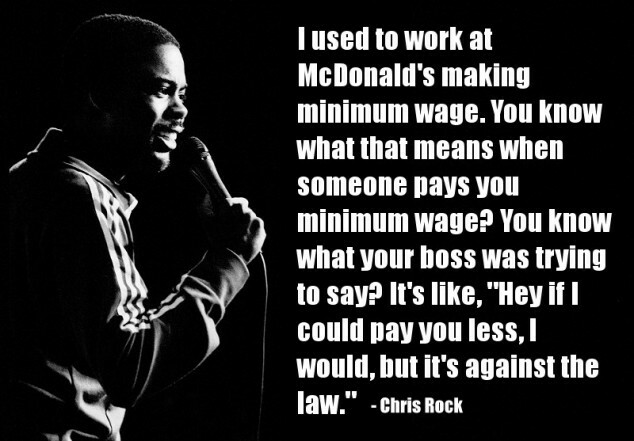 This, I believe, is the general predicament with minimum wage. Employers believe the wages of unskilled labor should be lower than they actually are, and employees feel as though they have the right to higher wages so that they may live affordably. Looking at the graph, we can see that at the current minimum wage of $7.25 an hour, the number of laborers employed is 100. This is because of the quantity demanded, or the number of workers that business owners are willing to hire, is 100. Contrastingly, the number of workers unemployed is 100 (quantity supplied minus quantity demanded at the intersection points of the minimum wage rate). If the national minimum wage were to rise, what would happen? According to the graph, the quantity of labor demanded would actually decrease to 30 and the quantity of labor supplied would increase to 300 (just think about it, a lot more people would now be searching for jobs if they discovered the new minimum wage to be $10.10). As a result, the number of those unemployed is more than double the unemployment value at $7.25. Imagine yourself as a small business owner and think about the consequences of such a spike in wages. At a higher minimum wage price, you would have to allocate more funds for paying your employees. Where does this money come from, you ask? It could be taken from the wages of your veteran workers, which means they would be taking pay-cuts to help fund the pay of new, lower-level employees (not to mention their incentive to work efficiently and productively is probably gone). The money could also come from the manufacturing budget, which results in less production. If the company is producing fewer goods and services, the firm does not need as many employees, which, or course, leads to people being laid-off and increasing the levels of unemployment. Moreover, the most important facet of your company that could lose money is your profits! I’m certain this would not fly with you considering you opened the business to make money. For sake of argument, let’s say the minimum wage appreciated and stimulated the economy, like some economists believe would happen. If you read my last post , you understand that stimulation would increase the number of jobs available. The issue that may arise through this theory though, is the law of diminishing returns. This law states that in all productive processes, such as the work of a frier at McDonald’s or of a shelf-stocker at a grocery store, adding more of one factor of production (an employee) will eventually yield lower per unit returns. In plainer terms, this suggests that adding more and more employees results in decreased marginal production. Why reduce this factor of production when firms could maximize production until marginal benefit equals marginal cost? Lastly, it is feasible that by raising the minimum wage we reduce the chances of unskilled laborers (e.g. people who did not finish high school or people who only have a high school diploma/GED) receiving job offers. The graph already indicates a shortage of 270 jobs at a wage rate of $10.10, so when firms do hire people they are probably choosing the best possible applicants who have the best chance of improving their skills, making it that much more difficult for unskilled workers to find jobs. I’m personally not sure if a spike in the national minimum wage floor is a good idea for the U.S., for there are factors on both sides of the argument that are swaying me in every direction. From a purely financial lens, it seems like raising wages does not bode well for a firm. At the same time though, I do not think its acceptable for some of our nation’s hardest workers to live below the poverty line. Especially when thinking about out larger corporations, like Wal-Mart and McDonald’s, I do not think it would be an extreme burden or great loss of profit to pay their employees above the minimum wage. Not only would their employees be able to live more comfortably, but the corporations would probably see increased production due to the whole efficiency wage principle…just a thought. This issue is so intriguing because economic theory is not the end-all-be-all. People across the country will be affected by whatever decision is made regardless of an appreciation. Emotions, rationalities, and the viewpoints of business owners throughout our nation are involved. I’m not sure we even know exactly what would happen with a wage increase, but hopefully this post made the topic clearer so you can arrive at your own conclusions. Looking at the graph, we can see that at the current minimum wage of $7.25 an hour, the number of laborers employed is 100. This is because of the quantity demanded, or the number of workers that business owners are willing to hire, is 100. Contrastingly, the number of workers unemployed is 100 (quantity supplied minus quantity demanded at the intersection points of the minimum wage rate). If the national minimum wage were to rise, what would happen?According to the graph, the quantity of labor demanded would actually decrease to 30 and the quantity of labor supplied would increase to 300 (just think about it, a lot more people would now be searching for jobs if they discovered the new minimum wage to be $10.10). As a result, the number of those unemployed is more than double the unemployment value at $7.25. For sake of argument, let’s say the minimum wage appreciated and stimulated the economy, like some economists believe would happen. If you read my last post , you understand that stimulation would increase the number of jobs available. The issue that may arise through this theory though, is the law of diminishing returns. This law states that in all productive processes, such as the work of a frier at McDonald’s or of a shelf-stocker at a grocery store, adding more of one factor of production (an employee) will eventually yield lower per unit returns. In plainer terms, this suggests that adding more and more employees results in decreased marginal production. Why reduce this factor of production when firm’s could maximize production until marginal benefit equals marginal cost? I’m personally not sure if a spike in the national minimum wage floor is a good idea for the U.S., for there are factors on both sides of the argument that are swaying me in every direction. From a purely financial lens, it seems like raising wages does not bode well for a firm. At the same time though, I do not think its acceptable for some of our nation’s hardest workers to live below the poverty line. Especially when thinking about out larger corporations, like Walmart and McDonald’s, I do not think it would be an extreme burden or great loss of profit to pay their employees above the minimum wage. Not only would their employees be able to live more comfortably, but the corporations would probably see increased production due to the whole efficiency wage principle…just a thought. This issue is so intriguing because economic theory is not the end-all-be-all. People across the country will be affected by whatever decision is made regardless of an appreciation. Emotions, rationalities, and the view points of business owners throughout our nation are involved. I’m not sure we even know exactly what would happen with a wage increase, but hopefully this post made the topic clearer so you can arrive at your own conclusions.